A 6 mile circular walk from Maze Hill Station around the Greenwich Peninsula. Route is accessable from North Greenwich Station (Jubilee line) which can also be an early finish point. Take a map to identify sites on the north side as you walk the Thames Path. This walk is not recommended at present due to building works in the area. Exit the station at the east end of the north (from London) platform. Maze Hill Station opened in 1873. The former ticket office is no longer used by the railway. Walk ahead into Tuskar Street and follow this to the left. The Hatcliffe Almshouses (pictured in header) were built in 1857 and extended in the 1880s & 1930s. William Hatcliffe who died in 1620, was manager of the King's stables. He left 5 cottages and 16 acres of land worth £800. At the end of the street go right along Trafalgar Road. Right into Tyler Street crossing Tyler Green. At the end left into Woodlands Park Road then left along Colomb Street. The Victorian houses and pubs were built 1843-51 but there are modern infills. The former Granada Cinema (seating 1924) was opened by Gracie Fields in 1937. Greenwich District Hospital (1972-2001) has been cleared for mixed use redevelopment. The site was previously occupied by the Union Workhouse (1840-1929) and St Alfege's Infirmary (1870-1960s). Cross to view panels depicting people of Greenwich in a small park. 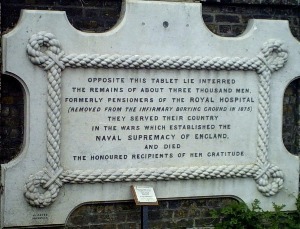 This was moved from the hospital site (see plaque). 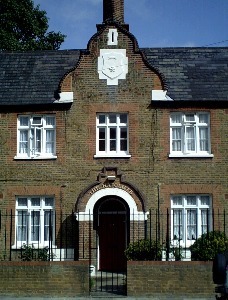 On the corner of Chevening Road is the former entrance to East Greenwich Pleasaunce (opened in 1857). A plaque on the wall on the right marks the reburial of 3000 Greenwich Pensioners in 1875 [pix]. The bodies were dug up when work was undertaken at the former burial ground at the hospital. In 1925 a further 1247 skulls and 58 boxes of bones were moved for the construction of Devonport House. The burial plots are in 5 main areas: the mass reinterment, officers, ratings & other ranks, Greenwich Hospital & Royal Hospital School and others. There are graves to a midshipman and captain who served at Trafalgar plus veterans of the Crimea and both world wars. It was last used in 1981. There is a cafe in the park [website]. Explore the area then exit at the far corner. Left along Halstow Road. At the end continue along Woolwich Road to the right. Option 1: Left along Tunnel Avenue between the library and the 'fire station'. Use the footbridge to cross the Blackwall Tunnel Approach to the cinema..
Option 2: Use the crossings to go under the Blackwall Tunnel Approach (signposted Thames Path) then cross to the Sainsbury Store. Walk past Comet and B&Q to the cinema. This development occupies the site of ammunition works which began in the 1880s manufacturing fireworks, flares and rockets. Go alongside the cinema, across Bugsby's Way and continue ahead. Walk across Southern Park bearing left to steps. These go up to a path - take this to the left. Go through the gate along the Outer Boardwalk to the Gatehouse. Option to explore the Ecology Park (generally open Wed - Sun 10-5). The Ecology Park has seven main habitats: lakes, marsh, shingle beach, shallow pools, wildflower meadow, willow beds and alder carr. There are bird hides, wildlife displays and children's activities. The Polar Sundial was constructed for the millennium by the Royal Engineers using 2000 bricks. It was a gift of the Tylers & Bricklayers Company. The riverside site was formerly occupied by Redpath Brown (1900-29) then Dorman Long (1929-77) who manufactured steel girders for Wembley Stadium and the Royal Festival Hall. During WWII they produced Morrison Shelters and Mulberry Harbour components. Further along is a pleasant area with equipment and feature rocks. Just past the jetty take the path to the left. At the park detour to the left. The Pilot Inn of 1801 and a terrace of mid 19th century houses (Ceylon Place). Eight remain from the original 31. Continue northwards through Central Park between West and East Parkside. Go right along Edmund Halley Way to the Thames Path and rejoin this going northwards (to the left). The jetty served the Blackwall Point Power Station, built in 1900. Further along were Frank Hills Chemical Works, using gas waste products. In the 1840s they had taken over the Trevithick Tide Mill of the 1800s which operated on the site. Beyond this was the South Metropolitan Gasworks. They purchased 100 acres of marshland in 1884 for £12,300 and later expanded onto the Frank Hills site. The QEII Pier, from which riverboat services operate, replaced the gasworks coaling jetty. Quantum Cloud is an artwork by Anthony Gormley. The Ravensbourne College occupies a striking building. To finish the walk go around to the left of the Dome through Peninsula Square following signs to North Greenwich Station. To continue go round to the right of the Dome through Meridian Gardens. There are views of Trinity Buoy Wharf and the entrance to the River Lea, Blackwall Yard and Reuters. The Meridian Line is marked. This is an area of industrial sites including Victoria Deep Water Terminal, Primrose Wharf, Amylum, Alcatel (formerly STC), Enderby Wharf, Piper's Yard and Lovells. At Ballast Quay is the former Harbour Master's Office (1855-1890s), Georgian houses and the Cutty Sark Tavern, originally the Union Tavern of 1804. Houses and pubs in this area were designed by George Smith in the 1840s - 1860s for Morden College. Their property badge is a black horse and 1695 (the date of their foundation). The old church of 1848 now houses the Forum Community Centre. A new church was built alongside in 1989. The Trafalgar Cinema first opened in 1912 and was remodelled in the 1930s to seat 1400. It became an Odeon in 1945 and closed in 1960. The Arches Leisure Centre was the former baths of 1928. Between these go up Maze Hill to access the station.